The 2005 IANDS conference featured fascinating presentations by Dr. Pim Van Lommel (author of the largest prospective NDE study that was published in the prestigious British medical journal The Lancet) talking about NDEs and the continuity of consciousness; Bruce Greyson (editor of the Journal of Near-Death Studies) discussing the NDE aftereffects on the religious and spiritual lives of experiencers; long-time NDE researcher PMH Atwater discussing techniques for experiencers to integrate their NDE into their lives; plus many experiencers describing their NDEs, often with special emphasis on the aftereffects. Order this one CD with all 28 MP3 files. Listen to them in your car (most newer cars have MP3 compatible CD players) , on your computer, or download them to an iPod or other MP3 player. Bruce Greyson was one of the founding members of IANDS, and served for many years on the Board of Directors, as IANDS’ President, Director of Research, and for the past 23 years, Editor of the Journal of Near-Death Studies. Bruce’s near-death research for the past three decades has focused on the aftereffects of the experience, and has resulted in more than 70 presentations to national scientific conferences, 100 publications in academic medical and psychological journals, and several research grants and awards. In keeping with the Virginia Beach conference theme of “Message and Meaning: Using the Near-Death Experience as a Tool for Living,” Bruce will present research findings about the impact of NDEs on experiencers’ religious and spiritual lives. The initial stage of Nanci Danison’s NDE journey consisted of a step-by-step transition out of human constructs into a natural state of Energy Being with an extensive range of sensory and intellectual abilities. Stage two involved meeting other Energy Beings and sharing with them her just-passed human life, and recapturing her memories from her eons of life. At this stage she had access to the whole of Universal Knowledge. She observed the evolution of planet Earth in three epochs, the second of which is about to end. She then focused her attention on the answers to humans’ most basic metaphysical questions, such as: “Who is God? Who are we?” Immersion/merger into the Energy Beings, and forward progression toward rejoining the Source, was the third stage. The final stage reversed the transition from Energy state to human context and reentry into the body. Chuck will present an experientially based approach using symbolism, analogy and metaphor designed to address typical barriers to communicating about near-death experiences and associated research to largely uninformed or under-informed audiences. He suggests that from laughter to awe to tears, we can talk to one another in loving, non-confrontational language and still be empirically relevant to the subject of NDEs. EFT is a simple and safe approach for dealing with some of the emotional issues commonly encountered in near-death experiencers such as posttraumatic stress disorder (PTSD). EFT is a self-healing method that is spreading rapidly across the country. It is an easy-to-learn energy psychology therapy. EFT involves self-tapping on acupuncture meridian points while repeating short statements about a particular emotional experience or belief. Activation of the energy meridians in this fashion deletes the body memory of the issue connected to the cognitive memory allowing anxiety to be replaced by emotional freedom. A brief EFT approach will be demonstrated during the seminar. Eight different acupoints are used in an abbreviated form of EFT, and once learned, the process takes about five minutes. EFT can be applied to a variety of conditions including fears, pain, self-image issues and negative beliefs. Near Death Experience... Is the Message for the Experiencer or Us All? It’s a Wonderful Life Review! “I have come with my whole life written upon me.” These are the opening words to an unseen God to be pondered in night-long meditation by a Jewish renewal rabbi on the evening of her ordination. And how true it is in the life review portion of the near-death experience. There is a flawless video of our entire life that we can view through empathic goggles in which we become all the players of our highest and lowest moments. The perennial Christmas week favorite film “It’s a Wonderful Life” reaffirms meaning through angelic intervention which shows a suicidal man what the world would be like had he not ever lived. In contrast, in the life review we see what the world is like because we have lived. The lessons of this review are available for all students of the literature, whether you have had such an experience or not. By understanding our ability to create joy or pain, we can reclaim our power and focus on living our lives by the light of spiritual understanding. During 26 years of researching the near-death phenomenon, PMH Atwater identified a pattern of physiological and psychological aftereffects. She has written about this extensively. Her discovery that it takes a minimum of seven years to integrate the aftereffects has since been clinically verified in a prospective study published in The Lancet on 12-15-01 (part of the Dutch Study led by Pim van Lommel, M.D.). After a discussion about identifying the pattern of aftereffects and integration phases, some experiential techniques will be presented. This will be an opportunity to learn how to “wear your body and use your mind” in fun, effective ways. Covered will be: another look at our bodies (wired by, powered by, guided by); use of the aura; the surprising power of breath; another look a body movements (zipping and unzipping); differences between thought and knowing, the power of attention (weight loss—modern parable of the manufacturing plant and the shipping clerk); prayer and meditation; living with electrical sensitivity. Ginette Nachman’s presentation will focus on the personal impact of NDE accounts, the importance of education of healthcare professionals working with patients who have had NDEs, and what the NDE tells us about the nature of human consciousness. Regardless of what one believes the NDE represents, people who have them are profoundly transformed and would benefit by being able to discuss these experiences with their healthcare providers. Many patients have reported feeling they could not discuss these experiences with others for fear of being considered “crazy.” Ginette will include a brief review of theories offered to explain NDEs, and the conclusion that whatever the ultimate explanation ends up being, it will still need to account for the fact that during NDEs people have access to information that could only be obtained non-locally (seeing/hearing things in other locations while out of their body, receiving information about future events, etc.) Furthermore, many NDErs continue to exhibit the ability to access information non-locally after the NDE has ended (increased psychic functioning: healing abilities). Debbie James has more than 30 years in Critical Care Nursing. She has held many positions including staff nurse, nurse manager and currently Clinical Nurse Specialist. She became interested in near-death experiences while completing her Masters program. She founded the San Antonio chapter of IANDS. She is both a local and national speaker. Debbie has been published in several professional journals. Diane Corcoran will discuss the importance of military healthcare providers understanding the NDE. A panel of military experiencers will be telling their experiences during this presentation. Diane will also show a tape of an interview with a young army soldier who had an NDE. 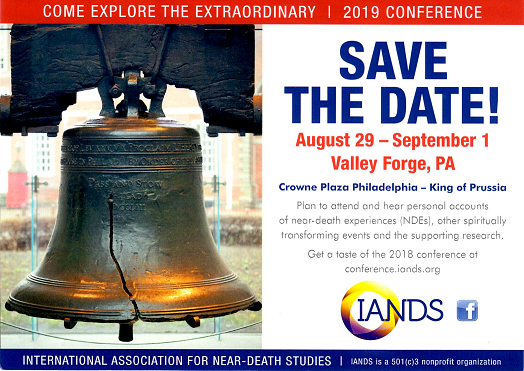 This presentation will focus on NDEs, nearing-death awareness experiences, shared or empathic NDEs, and post-death communications in so far as they help experiencers and non-experiencers to face dying and grieving. Examples of these experiences will throw light on such issues as meaning in life, death anxiety, continuing existence, and reunion with deceased loved ones. Bruce Horacek is a J. Terrence Haney Distinguished Professor in the Gerontology Department at the University of Nebraska at Omaha where his teaching and research specialties are dying, death, grieving and near-death and related experiences. He has published one book and over 40 articles, book chapters, and reviews, including 13 on near-death and related experiences. He has delivered over 40 papers at professional meetings. Dr. Horacek is consulting editor of the Journal of Near-Death Studies, is President Emeritus of IANDS, and served on the IANDS board for six years as vice-president and one year as president. He is a co-founder and coordinator of the Omaha Friends of IANDS. In 2003 he was named a Distinguished Alumni Professor at Marquette University. The pioneering work of Dr. Kubler-Ross helped bring modern scientific medicine to an acceptance of death as a natural aspect of life. The stigma of medical or practitioner failure (surrounding death) is increasingly replaced by the socio-medical doctrine of one’s quality of life over quantity of years. Higher quality of life, according to many near-death experiencers (and wise teachers throughout time and cross culturally), seems to contain both meaningful interpersonal and transpersonal connections. Scientific research supports the inclusion of “spirituality” in the healing process. Yet despite our “miraculous” ability to supplant biochemical processes of the body, there has been an undeniable iatrogenic cost to the vitality of the soul of the patient, family, and community. NDE and/or personal spiritual experiences can be introduced into the clinical encounter and can have significant bio-psychosocial-spiritual healing effects. But how does one open the door to bridge the gap between reproducible scientific certainty and the patients’ inner realm of spiritual meaning? This interactive session is intended for healthcare providers of all disciplines, but any interested persons are welcome to participate. Building on the work of others plus case examples of my own, I will illustrate techniques to bridge this scientific/spiritual gap in order to include spirituality into the clinical encounter. Audience participation is actively desired so please reflect on your own clinical experiences that you may wish to share with the attendees. Frequently individuals who have experienced NDEs (and those who study these people) have resisted the idea that NDEs may represent a form of dissociation. The resistance to this idea frequently centers around the generally accepted notion that dissociation is a form of psychopathology. As dissociative disorders are becoming more common, researchers are beginning to conclude that perhaps dissociation is much less pathological and much more adaptive than has previously been believed. It will be argued in this presentation that dissociation nearly always provides a certain amount of “healing.” The bulk of the presentation will be a case study of a woman who experienced several near-death experiences. Conference artist, Patreesa King disliked her job and did not want to go work. The universe gave her what she wanted in the form of a car accident that occurred as she was driving to work. Her resulting NDE also impacted her view of nature and its connection to her life’s works. Little progress has been made in advancing understanding of NDE-related electromagnetic sensitivity (EMS) since the phenomenon was brought to the attention of researchers by PMH Atwater. In an early study, Atwater (1994) reported that nearly three quarters (73%) of the NDErs she interviewed reported heightened EMS following their death crisis. This presentation will focus on the biographical EMS experience of a physician who had a childhood NDE. It is preceded by a brief summary of what is known about EMS (Rea et al., 1991) and followed by a number observations, and speculations on the nature of EMS phenomenon. I had three transformative experiences. First in 1984 a near death experience, where I underwent a life review that was the catalyst for two additional experiences. The life review started major changes in my life. I immediately received new understandings of acceptance, tolerance and my truth. These were new concepts to this chief engineer who worked on undersea exploration. Ten years later, I began reliving my NDE for three days while on a spiritual retreat where I had to face everything I had suppressed during the NDE. I began to hear Spirit in a more direct fashion. Since then, I started my quiet ministry by helping people who were drawn to me and planting seeds through my connection to Spirit. The third transformation occurred when I was diagnosed with stage IV lung & bone cancer. The doctors informed me this was incurable and terminal; I was told I should get my affairs in order. I had seen this in my life review, and I also had been shown that I was going to live beyond the cancer and the reconstructive spine surgeries. Now three years in remission, this third experience has focused the tools for living I had received in the first two experiences into a broader more purposeful mindfulness. My connection to Spirit helped to develop coping skills for myself and others who are facing terminal illness. The Scientific Analysis of Light in the NDE - Are God and Light the Same? This presentation begins by discussing the extraordinary feature of light in the NDE. Examples of NDEs are examined, including those from the current literature and ancient texts. The basic physical properties of light waves are reviewed. We witness the verification of Einstein’s special theory of relativity, which confirms that time stops at light speed. The ramifications of this concept are profound—indicating that a light wave can be everywhere in the Universe at once. Any entity with this capability also possesses omniscience (i.e., existing everywhere in the past, present, and future concurrently) and omnipotence. Scientific experiments, as well as quotes from world-renowned physicists and Nobel Prize winners, support these findings. All of these qualities, over the centuries, have also been used to describe God. The case is made that God and Light may well be same. This presentation presents findings from a study conducted concerning marital satisfaction and stability following the NDE of one of the marital partners. Focus of the study includes the changes in the meaning of marriage for the NDEr and spouse following the NDE. The findings presented in this discussion are the result of the only quantitative study that has been conducted that specifically addresses the effects of an NDE on a marriage. The presenter will summarize the study methodology, provide a detailed explanation of the findings, and present implications to NDErs, the NDErs’ spouses, other family members, friends, and professional caregivers. The journey from successful investment banker to ordained Kahuna (Hawaiian priest) for Lono Ho’ala involved water, electrocution, and navigating through a river of light. As he recovered from broken bones, heart arrhythmias, and grand mal seizures, he returned to the life he once held only to have his heart give out, and he found himself once again in the river. Lono shares the insights he gained from his NDE, and their consistency with the Hawaiian Kahuna philosophies. Conference attendees share their near-death experience with the audience. Compact Disc is a 2 CD set. In my lecture I will discuss the prospective design and the results of our Dutch study on near-death experience (NDE). I will discuss several universal elements that can be experienced during the NDE, and their implication for our concept, how consciousness and memories could be experienced outside the body during a temporarily non-functioning brain. How is consciousness related to the integrity of brain function? I will explain some neurophysiology of brain function during cardiac arrest and in a normal functioning brain. I will talk about some aspects of quantum mechanics in trying to understand the essence of our consciousness, and its relation with the brain and with our continuously changing body. While my childhood NDE brought in sensitivities and values that made me feel different from other children, as a 60 year old woman I can look back on my life and see how the NDE created incredible freedom for me. After discussing ways that I individually have felt liberated by my own NDE, I will also discuss ways that the awareness of NDEs is liberating not only medicine and science, but also our society as a whole. In the field of medicine, we are studying the impact of prayer and energy work on illness and wellness. We are reconsidering our definition of consciousness. The rise of hospice care in the past 30 years has supported the change in values that are occurring because of the widespread awareness of NDEs. As a result of the prevalence and general awareness of NDEs and hospice care, we are maturing as a society toward values that embrace a sense of connectedness with all living beings with an emphasis on the spiritual aspects of life rather than the material. Social worker and NDEr Kimberly Sharp discusses how the near-death experience can be used for specific clinical interventions in private practice and in medical and public service settings. How is it that persons returning from their near-death experience look upon the world with new eyes and a new sense of freedom? The answers lie in experiencers’ understanding of how the universe works. Some experiencers return with an understanding of how everything in the physical and non-physical world is tied together. Their changed perceptions of time and space are the foundation of a new sense of freedom. Scott will present the results of a four-year qualitative research study that was the basis of his doctoral dissertation in Education Leadership. He will discuss interviews with over 200 persons. This autobiographical ethnography captures the evolution of a participant observer’s understanding about the nature of the near-death experience. In addition, he will detail his 22-year personal journey for meaning following his near-death like experience.